Battery backup in the event of a power outage? Temperature control doesn't operate properly, preventing you from keeping warm. Temperature will remain at a default setting as determined by the manufacturer. Information such as date, time, and weather news/info will not be available. Custom temperature settings will no longer exist, including both the temperature itself and the on/off times. Thermostat will not function during a power outage. If a "low battery" warning light or tone comes on, then it's time to switch out the batteries. Locate the battery compartment cover, which is usually quite visual, on either the front, back, or side of the unit. The batteries are often released by pulling on a cloth or plastic tab, but some units require a screwdriver to get into the compartment. Switch out the batteries and replace the battery compartment cover.? 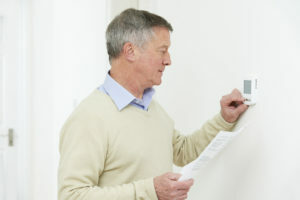 For more expert advice on thermostat maintenance or other questions related to home comfort, contact the HVAC professionals at Hartman Brothers Heating & Air Conditioning. We've been serving the needs of New Haven and the surrounding areas since 1963.